Czech Americans are known to have excelled in just about every aspect of human endeavor, including business, religion, government & politics, law, music, dramatic art, visual art, creative writing, publishing, media, education, activism & reform, the humanities, social sciences, biological sciences, physical sciences & mathematics, engineering, medicine, military, exploration, espionage, sports, and modeling (Encyclopedia of Bohemian and Czech American Biography, 2016). Now it turns out that they also excelled in astrology! I am referring to an American astrologer and author William Grant Lewi, 2nd whose grandfather Josef Lewi, was a Forty Eighter from Radnice, Bohemia, who escaped from the Austrian prosecution by immigrating to America, and settling in Albany, NY. William F. Grant Lewi, 2nd was best known for his books Astrology for the Millions and Heaven Knows What, and was described as the father of modern astrology in America. Grant Lewi books, then and now. Grant Lewi was born in Albany, New York, on March 24, 1902. He graduated from Hamilton College, Clinton, NY, and did graduate work at Columbia University. After earning a Master’s degree from Columbia, he taught English at Dartmouth and at the Universities of North Dakota, and of Delaware. William F. Grant Lewi, II. Known as Grant Lewi. In 1926, he married Carolyn Wallace, whose mother, Athene Gayle Wallace, was an astrologer and gave Lewi his first lessons in the field. Although he had written several fairly successful novels, Lewi turned to astrology in the early 1930s to supplement his income. 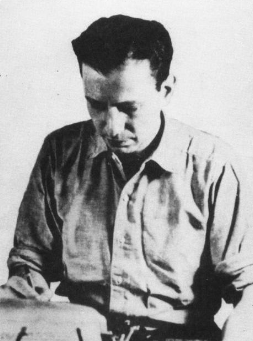 He wrote the eminently successful Heaven Knows What (1935). In the late 1930s, he became editor of Horoscope Magazine, for which he also wrote articles through the 1940s. In 1940 he issued his first astrological text, Astrology for the Millions (1940), an early attempt to make astrology available to the average person who had never studied the details of horoscope construction. Like Heaven Knows What, it has gone into many editions and remains in print today. Lewi devised a unique approach to astrological interpretation based upon equating house and sign indications, a method later developed by Zip Dobyns as ‘the Zip code.’ He also utilized certain psychological considerations at a time when astrology was more event-oriented. He used transits exclusively for predictive purposes. This approach was developed in his Astrology for the Millions and certain of his magazine articles. Lewi’s major works remain popular to the present day and have introduced countless numbers of people to astrology. 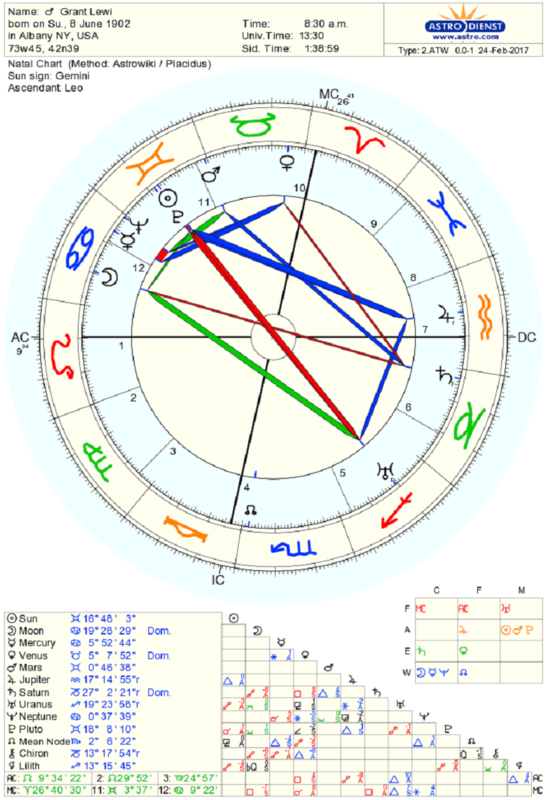 Astrological chart of William F. Grant Lewi, II, aka Grant Lewi. His father, William Grant Lewi was born in Albany, NY on March 23, 1870. He was educated in the Albany public and high schools, after which he accepted a clerkship in the drug store of his brother, Theodore J. Lewi. He remained in the drug store four years, in the meantime attending the Albany College of Pharmacy, where he finished the course in 1890 and from which he received his diploma in 1891. While a senior at the College of Pharmacy, Dr. Lewi entered the Albany Medical College, from which he received the degree of M. D. in 1892. Since then Dr. Lewi had practiced in Albany. The year following his graduation he was appointed instructor in physiology in the Albany Medical College; later he took the chair of instructor in nervous diseases as assistant to Dr. Hun, and he is at present instructor in Materia medica, therapeutics and medical technique. He was also first lecturer in pharmacy, a chair instituted in 1890. Dr. Lewi was physician to the dispensary of the Albany Hospital and was a member of the Albany County Medical Society. He became famous by adaptation of electric equipment, used by Roentgen, in the treatment of sympathetic nervous system. He was the author of a series of medical books. His grandfather, Josef Lewi, was born in Radnice, Bohemia on August 17, 1820. He was one of a large family of children and while he attended the preparatory schools at Pilsen, he helped to defray the expenses of his education by teaching. From the Gymnasium in Pilsen he went to the academy at Prague where he took the higher classical course and began the study of medicine. He then went to the University of Vienna, where he continued his studies under the guidance of the great men of that time, among whom were: Rokitansky, Hebra, Schuh, Hyrtl, Oppolzer. Skoda, Rosas, and other authorities. After obtaining his Doctorate diploma in 1846, he returned to his native town in Bohemia, where he practiced medicine for some time. In the memorable year of 1848, he participated in the revolutionary movement against Austria, whereupon he was forced to escape to America. He settled in Albany, NY, where, for half a century, he practiced medicine. He soon acquired a large practice, a high standing in the medical profession. According to his colleagues, he was an exemplarity physician. He was a person of kind disposition, broad knowledge and modesty, who enjoyed the respect of the whole community. He inspired confidence with his thoroughness and conscientiousness. At the beginning of the Civil War he was one of 41 citizens of the city, who formed a local branch of the United League. By the authorization of the Governor of the State of New York, Morgan, he became a member of the commission for examining physicians for the voluntary service in the army. He was president of the Albany County Medical Society and the senior member of the Board of Censors of the State Medical Society. He never aspired to public office but accepted the position of member of the Board of Public Instructions for a term of three years. In 1849 he married Berta Schwarz, with whom he had fourteen children, who distinguished themselves in medicine, journalism and in public service. – – – – – – end of guest post. So much greatness can be traced to Czech roots! Thirteen of Josef Lewi’s fourteen children survived him. The oldest son was the journalist Isidor Lewi (1850 – 1938). He was educated at The Albany Academy, became connected with several newspapers, and was an editorial writer on the “New York Tribune” and publisher of the “New Era Illustrated Magazine.” Another son, Maurice J. Lewi (born 1857), was a physician in New York City. He graduated from the Albany Medical College in 1877. After a postgraduate course in Heidelberg and Vienna he began to practise in his native town (1880). He became lecturer at the Albany Medical College and professor of medical jurisprudence at the Albany Law School. In 1891, he was appointed secretary of the state board of medical examiners. In 1892, he moved to New York City. Miloslav Rechcígl, Jr. is one of the founders and past Presidents of many years of the Czechoslovak Society of Arts and Sciences (SVU), an international professional organization based in Washington, DC. He is a native of Mladá Boleslav, Czechoslovakia, who has lived in the US since 1950. Read his entire profile here. Discover Mila’s many books on Amazon.